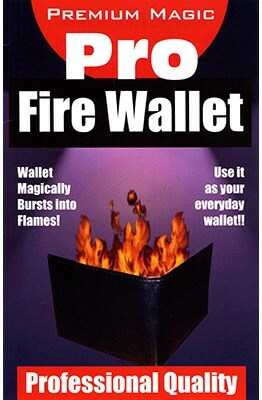 Regarded as the best fire wallet in the business, J B have this back in stock. This wallet will fit into any pocket, even jeans. It has been crafted from the finest leather. High flames, brass plates, new easy grip wheel, for first time, every time ignition. Open the wallet and it immediately bursts into flames. In a flash the flames disappear, the inside of the wallet is shown to be absolutely regular and full of money (supply your own money), business cards etc. These are made in BLACK only. Made from the finest leather. This wallet looks and indeed can be used as an everyday wallet. Not sold to anyone under the age of 18.